The addition of zinc or tin to copper produces the alloys bronze and brass, which are stronger than unalloyed copper. Lead and tellurium improve chip breaking, while aluminum and silicon alter the metal’s strength and malleability properties. Copper suppliers usually fabricate preforms in a couple different configurations-wire, which is thin and bendable, sheets, which are flat and easily bent, tubes, which are round, hollow profiles, and rods and bars, which are solid, long and have differently shaped, uniform profiles. Copper is a highly desirable metal for its attractive color and finish, electrical and thermal conductivity, resistance to oxidation and rusting, and its ability to handle continuous exposure to chemicals, extreme temperatures and moisture. It is also quite flexible and malleable, making it easily machined and formable. Copper and its alloys are supplied to many different industries, including the automotive, architectural, building construction, electronics, food processing, marine, aerospace, wiring, power generation, lighting and telecommunications industries. The preforms are fabricated into piping systems, propellers, hardware, kitchen products, small springs, wires, adapters, electrical connectors, lighting, valves, coins, offshore drilling equipment, microchips and roofing. It is also a non-sparking metal, which is a highly valuable property in applications inside hazardous areas that have exposure to combustible or explosive vapors and gases, like oil rigs. Copper is formed and fabricated 3 different ways; they are cast, wrought, or pressed and sintered copper in powder form. 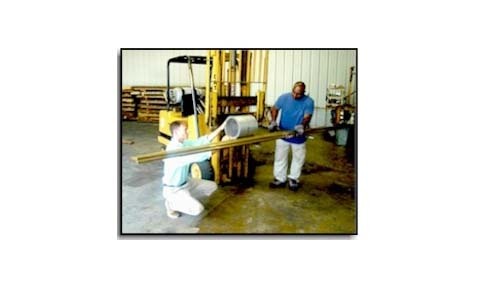 The casting process involves heating the copper preform until it becomes molten and injecting or pouring it into a metal mold that is in the shape of the desired product. These products are usually three dimensional, complex in design and have a high degree of repeatability. Wrought copper has been mechanically deformed with or without the application of heat. These processes include drawing and extrusion, which forces a copper bar or rod through a mold with the profile of the desired product. This creates large amounts of excess waste material, which is easily recycled within the plant. Other fabrication processes include stamping, rolling, forging, cutting, etching and engraving. Post fabrication processes include annealing, which alters the hardness levels of the copper/alloy, polishing and surface cleaning. Brass products that are exposed to outdoor environments are almost always coated in a clear varnish, which provides protection as well as a shiny finish. Copper Suppliers Copper suppliers manufacture and distribute preformed copper and copper alloy billets, blanks and parts. While some applications require pure copper, most products are copper alloys that are mixed with another material, which enhances or improves certain properties.